When you make your home in the Fort Worth area, it’s important to have a sturdy roof that will last for years. Scorching heat and sunlight combined with severe storms can cause significant wear and tear on residential roofs. Knowing that you can count on the best roofing contractor in Fort Worth to help your roof stay in excellent condition will provide you with peace of mind. When you hire Acme Roof Systems for roof installations, maintenance or repairs, you’ll be getting the highest quality service around. We’ll make sure that your Fort Worth home has a durable roof that will be able to withstand rain, hail, sun, and wind. Living in Fort Worth offers many advantages for homeowners, including great schools, a highly affordable cost of living and convenient amenities. The average home price in the Fort Worth area is $122,000, which is considerably lower than the average home price of $131,000 in the state of Texas. If you’re working on your budget for living in Fort Worth, you may be pleased to know that the average cost of maintenance for residential homes here is around $42 per month. That’s a more than reasonable price to pay for making sure that your home is in good shape throughout the year. When you’re looking to settle in Fort Worth, you’ll have a number of neighborhoods to consider. West 7th offers tons of entertainment, dining options, and trendy retailers, while Camp Bowie West has a historic look and feel that resembles the mid-20th century. The downtown area provides a clean and safe neighborhood that is highly walkable, which makes it easy to get to all of the shops, restaurants and other amenities it offers. The Stockyards neighborhood has a distinctive Western flair to it, while the Cultural District is filled with artistic and cultural attractions and amenities. In the Southside neighborhood, you’ll find a wide range of restaurants to try, along with live music venues and theaters. The Fort Worth area provides an impressive number of things for residents to do. When you make your home here, you won’t run out of places to see and visit. Whether you like arts and culture, historical attractions or outdoor attractions, you’ll soon discover that you’ll have a long list of venues available to you. Science lovers can head to Fort Worth Museum of Science to learn more about our universe, the area’s natural history and more. For those who want to learn more about wildlife, the Fort Worth Zoo houses more than 7,000 animals in exhibits that resemble their natural habitats. If you would rather spend time with plants and trees, head to Fort Worth Botanic Garden where you can explore 22 specialized gardens. At Kimbell Art Museum, you can see impressive works of art and architecture from around the world, including Pre-Columbian art and Asian art. 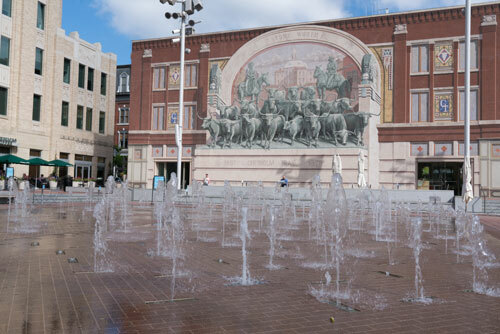 Other attractions in the Fort Worth area include the Modern Art Museum of Fort Worth, National Cowgirl Museum, Sir Richardson Museum and Texas Cowboy Hall of Fame. Outdoor enthusiasts can head to Benbrook Lake for fishing, boating, and other aquatic recreational activities, or see bison, wild birds and other wildlife species at Fort Worth Nature Center and Refuge. Other notable places to spend time outdoors in the Fort Worth area include Trinity Park, Grapevine Lake, and Tandy Hills Natural Area. Just finished another great job.